This ball and chain has many uses. It is popular with both our directors and our Halloween customers alike. Suggestions for use include prisoners, convicts, clowns, or a funny gag gift for newly married couples. It is often used by our directors for the Prisoner of Love scene in “The Producers”. 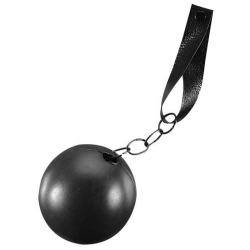 The ball portion is made of light weight and durable black plastic with a silver metal chain attached to a black vinyl cuff with snap closure making it easy to put on and remove.